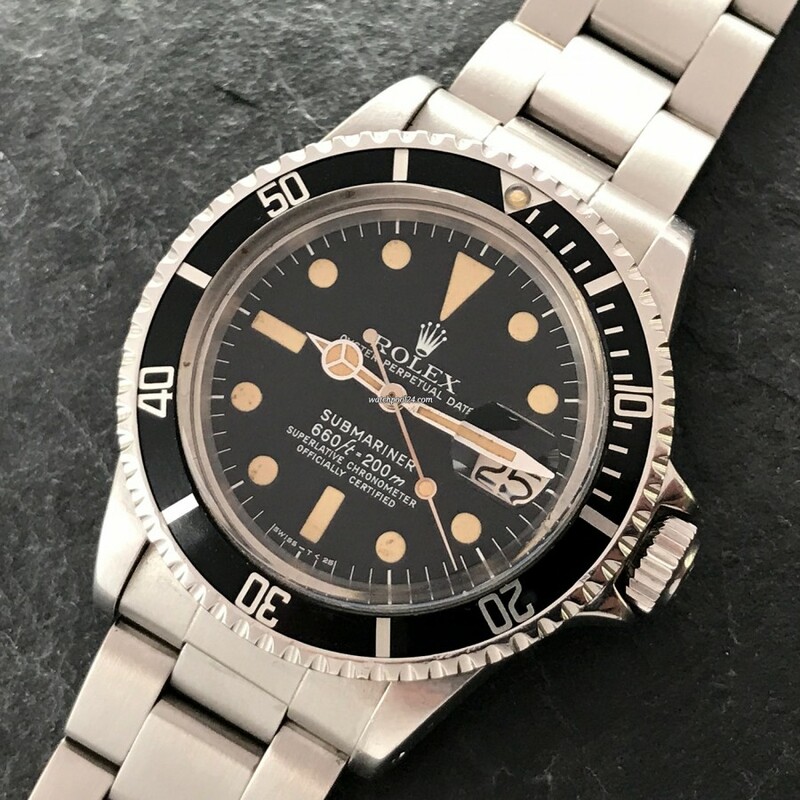 This is a greatly preserved example of a Rolex Submariner 1680 from 1978. Every single part from dial to the bracelet is authentic and matches perfectly the year of manufacture of the watch. The reference 1680 was the first Submariner with the date at 3 o'clock and the magnifying Cyclops lens affixed on the acrylic crystal. This particular version of the Ref. 1680 with throughout white printed dial was manufactured from 1976 to ca. 1979. The original dial of this Submariner has a flawless black surface. The beautiful, age-related patina is expressed by the creamy color of the hour markers and hands. The case is in great condition with few signs of usage. The reference and serial numbers are engraved between the lugs and are still visible. The black bezel is rotatable in both directions. It has the intact pearl at 12 o'clock and is in perfect condition. The Oyster bracelet looks authentic and shows a condition that is very similar to the case. This suggests that the bracelet originally belonged to the watch. All engraved numbers are a perfect match for the year of manufacture. The bracelet reference 93150, 580 end links and the code on the clasp is "VD". The bracelet has a "patented" signed diver's extension. The movement is the Rolex caliber 1570 with additional date function. The watch has been checked and is running perfectly keeping exact time. This Rolex Submariner 1680 convinces in the first place with its greatly preserved condition. The original components fit perfectly to the age of the watch, which makes this watch more collectable.